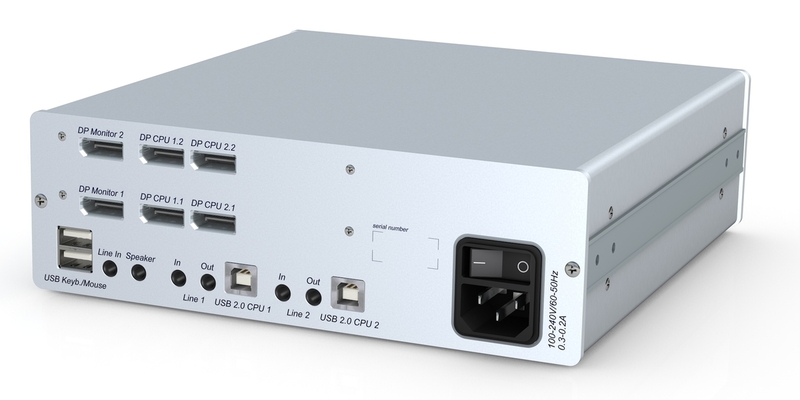 The DP1.2-MUX2-MC2-USB KVM switch enables you to operate up to two computers dual head via one console with dual screens. The console is provided with a USB keyboard, a USB mouse and a DisplayPort™ monitor. The computers connected to the KVM switch are operated from the installed console. The DP1.2-MUX2-MC2-USB KVM switch enables you to operate up to two computers dual head via one console with dual screens.The console is provided with a USB keyboard, a USB mouse and DisplayPort™ monitors. The computers connected to the KVM switch are operated from the installed console.The switching between computers takes place either via the push buttons on the front panel, configurable key combinations, or a serial device which is connected to the Service- or RS232 port. The front panel of the device provides two USB 2.0 interfaces to operate any USB devices. The connected USB devices are available to whichever active computer. The KVM switch emulates keyboard and mouse on each channel and hence guarantees error-free booting at all times. More standardized resolutions within the max. pixelrate and refresh rate between 24 and 120 Hz possible.